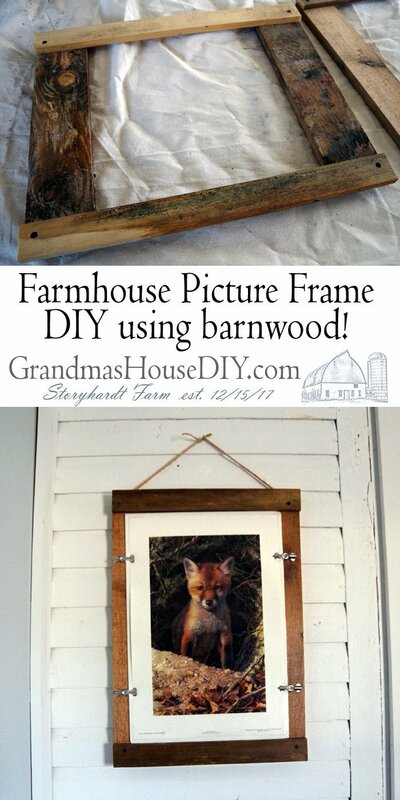 Unique, easy to build, Farmhouse picture frame. I’ve been thinking about a different way of creating a picture frame ever since I built a “typical” frame for my aunt for her birthday. (See that project here.) I wanted something easier to build that didn’t require mitered corners etc. 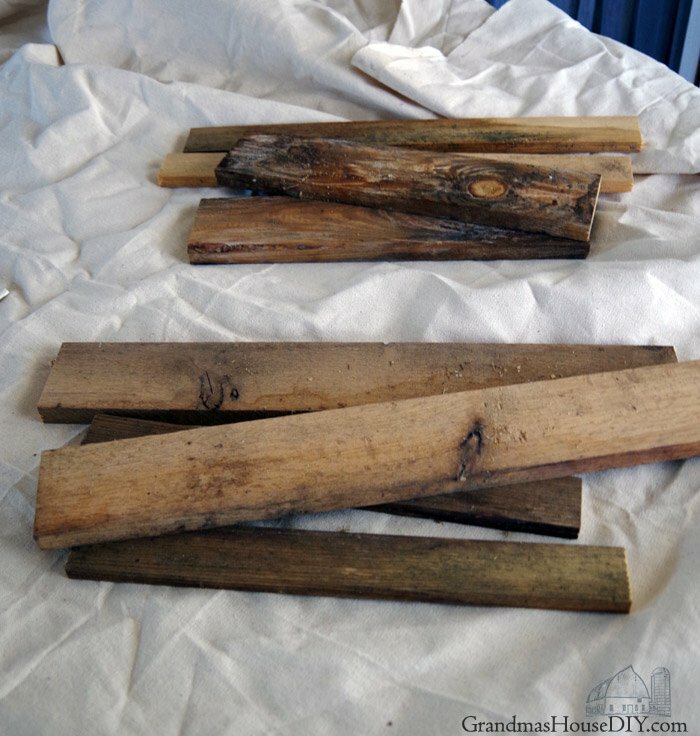 I got to looking online and saw several gallery ideas using big pieces of wood, some out of pallets, some using barn wood and some using purchased wood that they built big backs out of. First thing was I knew I wanted it to look like there was a solid piece of wood covering the whole back of the print and that was also large enough to create a “frame” around the outside. 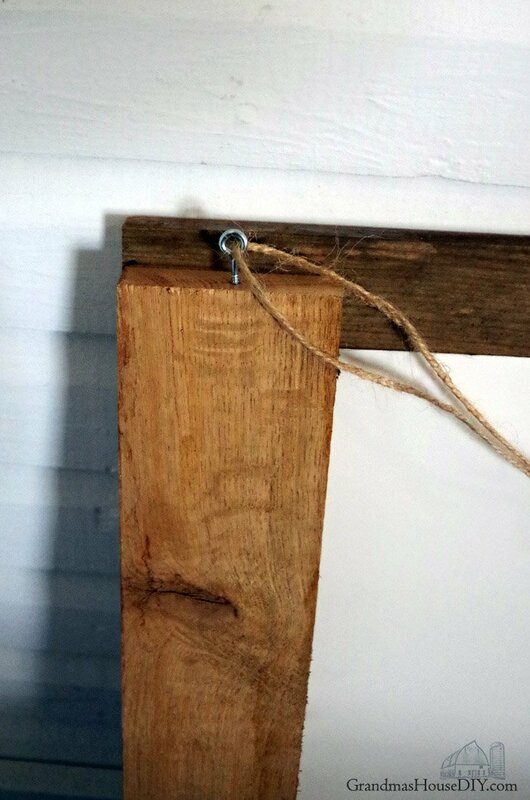 I also wanted it to be more farmhouse looking so, right away, I knew I wanted to hang it with twine. So, I headed to my barn and I grabbed one 1×4 and one 1×2 that were each long enough to create the entire picture frame. First I sanded them down and cleaned them up with vinegar to get the grain to really stand out. The 1×4 I cut in two pieces to the height of the picture frame plus the width of the 1×2 times two. Then I cut the 1×2 in two pieces to the width of the picture plus the 1×2’s width times two. Then I screwed them together, the 1x2s across the top and bottom of the 1x4s. (I pre-drilled before screwing them together because boards this small are notorious for splitting.) I then put a coat of satin poly acrylic over the whole thing. The print fits perfectly over the 1x4s and up against the bottom and top of the 1x2s. I found these little clip attachments at my local hardware store that looks so old school farmhouse that it was clear I just HAD to use them. I opted out of using plexi glass or glass for now simply because of cost. Instead I did a coat of satin poly acrylic over the face of the print. I cannot vouch for this AT ALL – it seemed to work fine for my two prints but it may not work for yours! 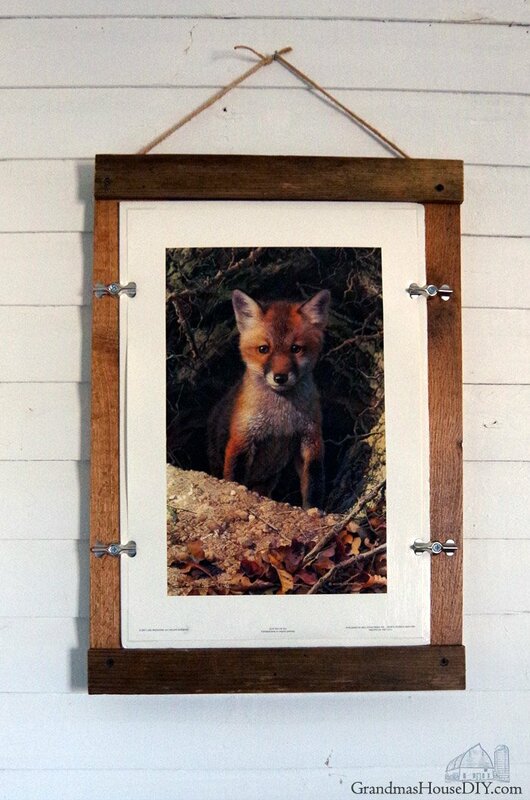 I screwed two eye hooks into the top of the frame on either side and then used a piece of twine to hang the print. All in I am totally happy with how this picture frame turned out. What I’m really excited about was how EASY this was to make, without having to miter the corners means almost anyone could build it! As another option too: a board could be added to the back to create a standing frame for desks or on shelves. 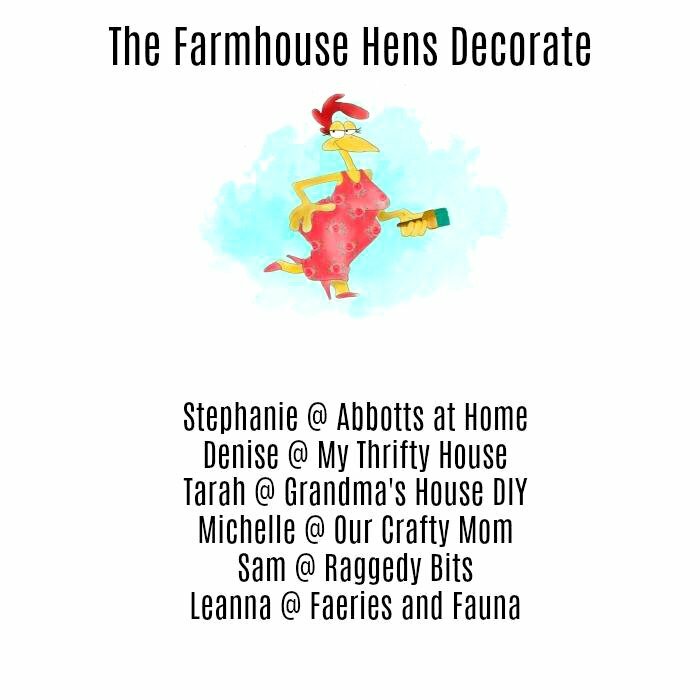 Make sure and check out the rest of the projects from the Farmhouse Hens this week, be prepared for some really creative picture frame ideas! Looks great, Tarah! Love the pictures you chose too. It all works perfectly. Thank you Stephanie, have a great weekend! Great job. 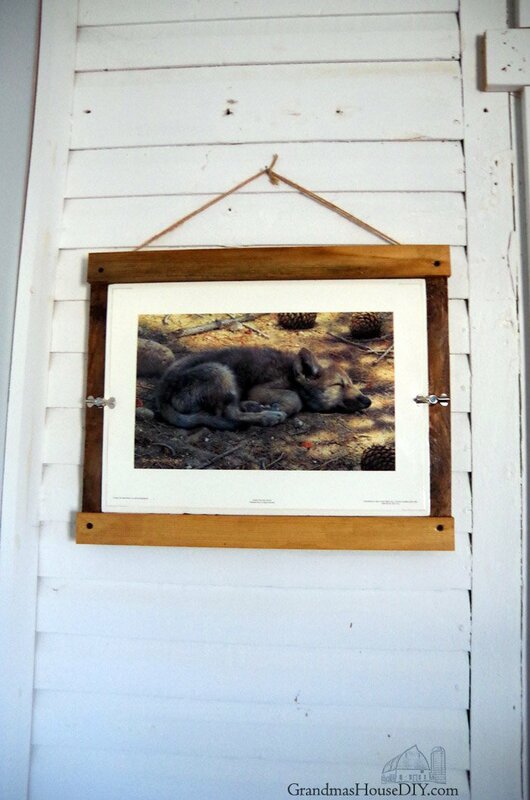 I love the rustic look of the frame and they are perfect for the prints you chose. 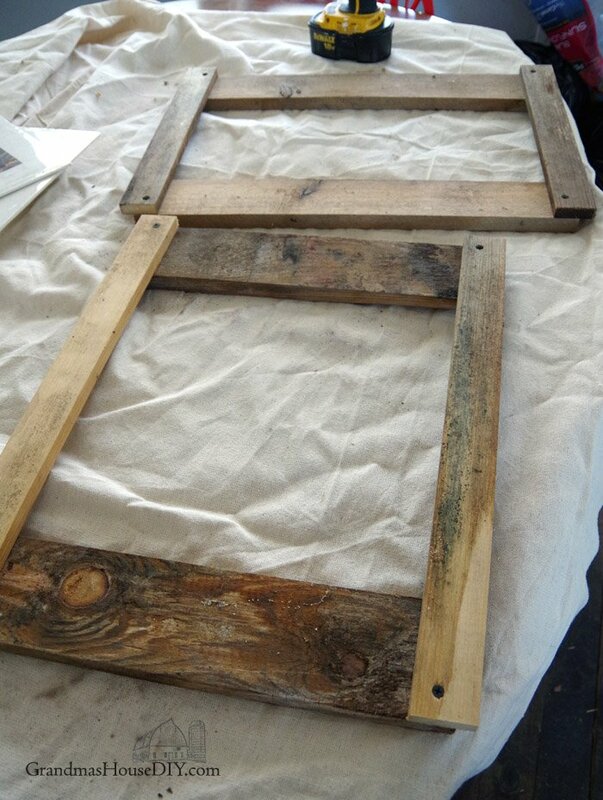 Nothing better than recycled Barnwood! Your frames turned out so lovely and how cute are your pictures! Hello! 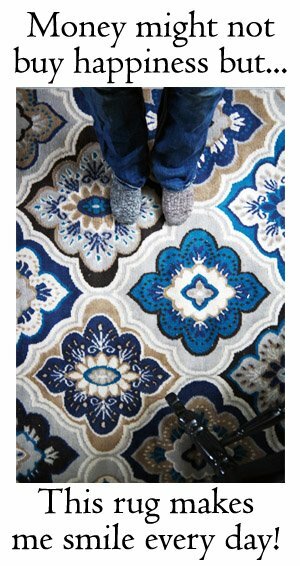 I absolutely LOVE this project and am wanting to make some of these for my home and gifts. I’m having trouble figuring out what the little clips that good the photo art in the frames. Can you please describe them, or send me pictures? And details as the where you found them. They weren’t listed in your supply list for this project. 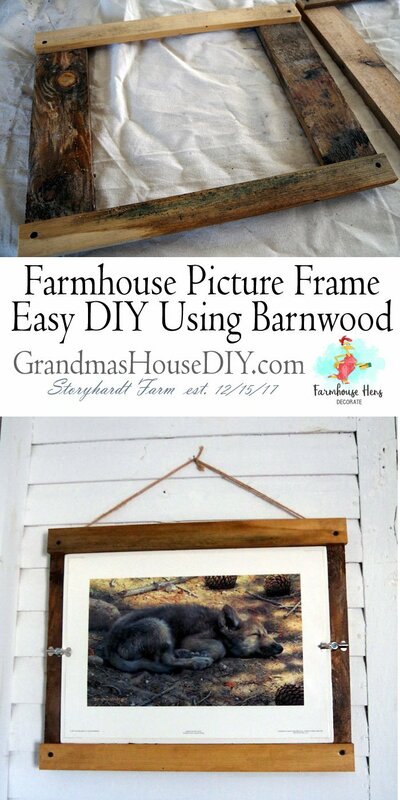 I love, love this barnwood frame! And the pictures you used are just gorgeous!! Beautiful project! 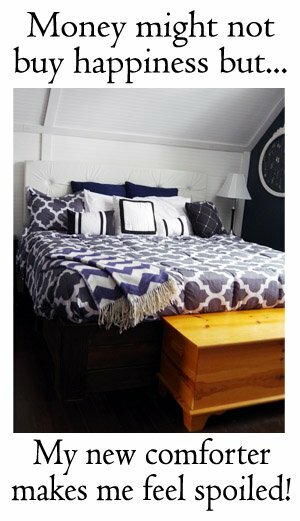 old barnwood is so beautiful! and those clips you used are genius – thanks for sharing this week at our Encouraging Hearts & Home Blog Hop this week! These came out amazing!! 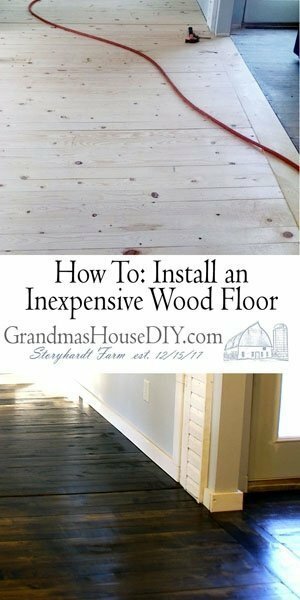 What a great project 🙂 Thanks for sharing on Homestead Blog Hop! What a cute project! Thanks for sharing at Home Sweet Home!